Metallothionein (MT) is a low-molecular-weight,cysteine-rich metal-binding protein that play a role in the regulation of Zn and Cu homeostasis, and cell defense against heavy metal toxicity and free radical activity. We have been reported that the female MT-null mice showed higher sensitivity to high fat-diet induced obesity than wild type mice, and that primary preadipocyts (progenitor cells) derived from Mt-null mice showed higher potency in adipogenic differentiation than wild type mice. 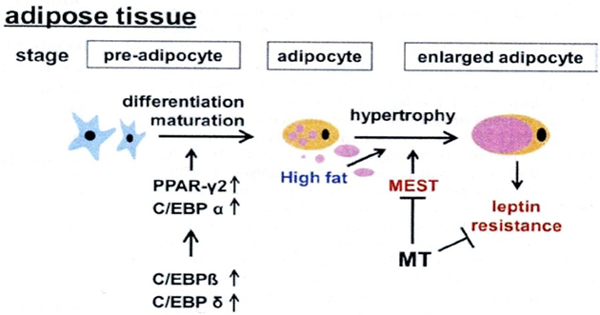 Thus we have now investigated the functions of MT on the adipogenesis involving in an adipogenesis-related gene MEST expression in fat, oxidative stress in fat, modulating effect of metal in adipogenesis. Further, the effects of exposure to endotherial reticulum (ER) stress to pregnant maternal mice on the adipogenic development and modulation of metabolic disorder in the neonates after birth are also studied. Kawakami T, Yoshimi M, Kadota Y, Inoue M, Sato M, Suzuki S. Prolonged endoplasmic reticulum stress alters placental morphology and causes low birth weight., Toxicol Appl Pharmacol., 275:134-44 (2014). Kawakami T, Nishiyama K, Kadota Y, Sato M, Inoue M, Suzuki S. Cadmium modulates adipocyte functions in metallothionein-null mice., Toxicol Appl Pharmacol. 1;272(3):625-36 (2013). Sato M, Kawakami T, Kadota Y, Mori M, Suzuki S. Obesity and metallothionein. Curr Pharm Biotechnol., 14(4):432-40 (2013). Higashimoto M, Isoyama N, Ishibashi S, Ogawa N, Takiguchi M, Suzuki S, Ohnishi Y, Sato M. Preventive effects of metallothionein against DNA and lipid metabolic damages in dyslipidemic mice under repeated mild stress. J Med Invest., 60(3-4):240-8 (2013). Kawakami T, Hanao N, Nishiyama K, Kadota Y, Inoue M, Sato M, Suzuki S. Differential effects of cobalt and mercury on lipid metabolism in the white adipose tissue of high-fat diet-induced obesity mice. Toxicol Appl Pharmacol. 1;258(1):32-42 (2012). Suzuki　S., Tomita M., Hyodo M., Horikawa M., Tsunoda T., Sato M. Pigments from Uroleucon nigrotuberculatum induce apoptosis in HL60 human leukemia cells, implicating intracellular oxidative stress and activation of caspases. Biol. Pharm. Bull. 29, 2383-2387 (2006). Suzuki, S., Okuse, Y., Kawase, M., Takiguchi, M., Fukuyama, Y., Takahashi, H., Sato, M. A Norbergenin derivative inhibits neuronal cell damage induced by tunicamycin . Biol Pharm Bull, 29, 1335-1338 (2006). Suzuki S., Masui Y., Ohnuki M., Miyakoda G., Mori T., Nakajima K., Sato M. (2007) Induction of metallothionein synthesis by Cilostazol in mice and in human cultured neuronal cell lines. Biol Pharm Bull. 30, 791-794 (2007). Higashimoto, M., Isoyama, N., Ishibashi, S., Inoue, M., Takiguchi, M., Suzuki, S., Ohnishi, Y., and Sato, M., Tissue-dependent preventive effect of metallothionein against DNA damage in dyslipidemic mice under repeated stresses of fasting or restraint. Life Sci, 84: 569-575 (2009).